Almost 2 million people, mainly in western Japan, have been told to evacuate their homes, according to the fire and disaster management agency, but NHK said the figure had risen to nearly 3.2 million. Some areas have been hit by more than one metre of rain, while almost 48,000 soldiers, police and firefighters have been deployed for rescue operations, said the chief cabinet secretary, Yoshihide Suga. Another 21,000 troops are on standby. The Japan Meteorological Agency upgraded its alert system to the highest level - only issued when the amount of rain is expected to be the highest in decades - in large areas of western Japan while lifting the warning in other regions. Among the missing were five people buried when houses collapsed in Hiroshima prefecture. In Ehime prefecture a woman was found dead on the second floor of a home hit by a landslide, Kyodo said. 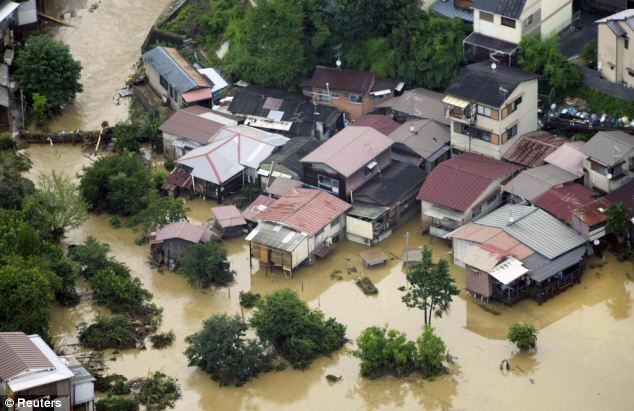 Kyoto prefecture said it was working to control flooding at several dams. About 250 people had to flee their homes and the prefecture identified one fatality as a 52-year-old woman. Roads were blocked in some areas and warnings were issued on landslides.